Be careful what you say or do in the town of Bomont, because there are eyes always watching you. 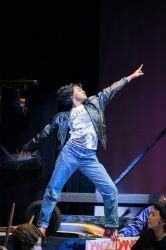 An energetic rebel from Chicago learns this lesson the hard way in The Madeira School’s production of Footloose, in which he challenges the status quo and town council for a basic necessity – dance. 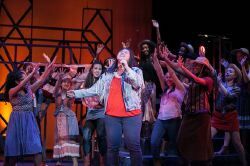 A movie adapted for the stage, Footloose follows the story of Ren McCormack, a Chicago native forced to move to the small town of Bomont. Haunted by the guilt of his father’s abandonment, Ren attempts to fit in among his peers and find love at the local high school. However, he soon discovers that according to a town ordinance, dance is forbidden. He falls for a rebellious girl (Ariel) who happens to be the overprotective minister’s daughter. 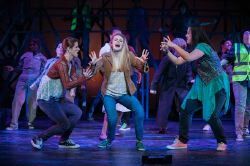 Although it may be difficult to perform a musical with an all-girl cast, Madeira performed admirably. The lack of male vocalists had no impact on the quality of their performance. In addition, the infrequent sound issues never fazed the cast. Both Ren McCormack (Gabrielle Bullard) and Ariel Shaw (Jessica Schwartz) were admirable in their portrayal of their characters. Always energetic, the two showed no dearth of humor or characterization, even while singing numbers like “Always Paradise.” Onstage, the two showed a remarkable tenderness, as they confided in each other their family problems over the noise of passing trains. Standout performances among the supporting cast were numerous, such as Rose McAvoy’s portrayal of Wendy Jo and Katelynn Barack’s role of Willard. A slightly ditzy redhead and a slow-witted, yet lovable country boy, both Barack and McAvoy provided a foil for Bullard to shine. With their boundless enthusiasm for helping Bullard’s character, they provided an impactful onstage presence. Showing her comic chops, Barack turned into a lovable goof as the cast learned that Willard had two left feet, falling at the “hottest dance house in the tricounty area.” Always animated, whether giggling at gossip or in fits of temper, both McAvoy and Barack enhanced the performance. Another star onstage was the frail, meek Vi (Caitlin Fischer). Her portrayal of Ariel’s mother was touching, as she poured her heart out in the song “Can you find it in your Heart?” Indeed, Fischer’s impressive vocals reached sonorous heights during that song, as she begged her husband, Reverend Shaw, to heal their family. 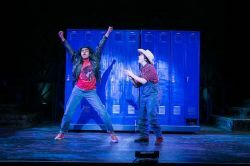 With rocking tunes, an impressive cast, and their journey to reclaim dance for the town of Bomont, Footloose was a hit. 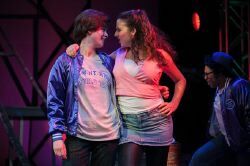 Ultimately, The Madeira School’s production showed that although letting go of the past may be tough, sometimes it is better to just cut Footloose. This article can be linked to as: http://showbizradio.com/go/10001.